Rukia-Ichigo-Grimmjow-Toshirou. . HD Wallpaper and background images in the Bleach (Anime) club tagged: bleach hitsugaya toshirou ichigo kurosaki rukia kuchiki ulquiorra grimmjow. 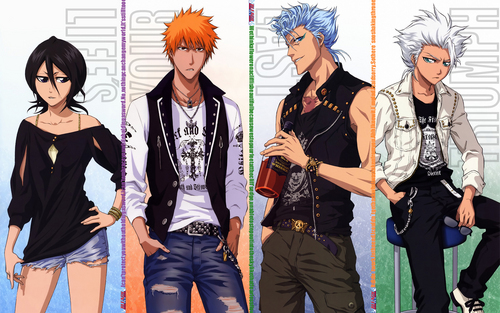 This Bleach (Anime) wallpaper might contain gut gekleidete person, anzug, hosenanzug, pantsuit, oberbekleidung, überkleidung, overclothes, lange hosen, and lange hose.